The Cornell University Airmouse Initiative is a motion sensing glove with buttons on it that plugs into your computer to function as a mouse. Many tasks that are performed on the computer require the use of both a keyboard on the mouse, and many people find it frustrating and awkward to have to switch back and forth between them. So, we've created what we believe to be the solution to this dilemma, as you can wear the glove on your hand while you're typing and then when you want to move the mouse cursor, simply push a button that is already on your hand and point your finger at the screen and move it around. The Airmouse is comfortable to wear, and does not significantly inhibit typing. It functions completely as a two button serial mouse, and even implements variable rate vertical scrolling. Our project was inspired by two sources. Firstly, when Professor Land exclaimed, "I have free accelerometers, and they [can do cool things]," we felt as if we should explore the possibility of using them. We thought for a while about what kind of awe-inspiring device we could construct with acceleration sensors, and then we found our second fountain of inspiration - the mouse-glove that Tom Cruise used in Minority Report would not only be very neat were it real, and it was not impossible to make it real. Accelerometers seemed to be the ideal sensor for constructing a hand-mounted pointing device. This approach, however, turned out to be a practical impossibility. While we successfully implemented the Verlet scheme and watched a mouse cursor controlled by the scheme move on the screen as we expected it to, the glove had to be held exactly at 0g (or 1g for earth-normal) in all three directions. If gravity were allowed to affect the accelerometers at all, this acceleration added into the integral, and with no negative acceleration to remove it, the change in position that we calculated grew boundlessly. We needed gyroscopes to measure gravity so that we could remove its effect from our calculations, but gyroscopes are not inexpensive, and the cheapest ones cannot be soldered by human hands. Because of this, we decided to construct a tilt mouse instead. While not as impressive as a position tracking device, the tilt mouse is easy to use (after a bit of practice) and almost as neat as a position tracking mouse. The math behind this scheme is very easy - measure the acceleration due to gravity on the mouse, and multiply this by some constant to scale your output to a desirable level. 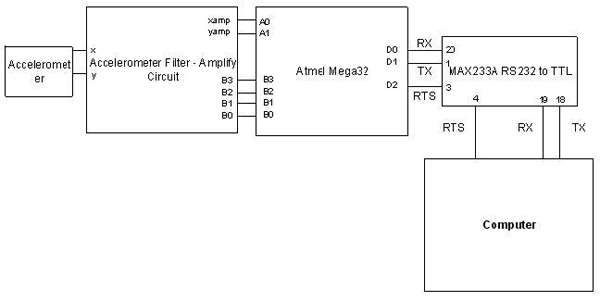 The Microsoft serial mouse protocol uses an 8-bit twos complement number scheme to send data to the computer, and the numbers outputted by the Atmel Mega32's analog-to-digital converter can be conveniently represented in the same number of bits. However, the numbers outputted by the accelerometer had to be altered to normalize voltage extremes to -128 and 127 and the accelerometer's neutral output to 0. We will discuss in the next section, Program/Hardware Design, exactly how this was done. In addition to scaling the output, we also used a step filter on the data to make the mouse easier to use. Our accelerometer was so sensitive that the slightest motion of one's hand would cause the device to output a nonzero acceleration. To give the user a more stable region around the zero point, we quantized all outputs below a certain level to 0, then normalized any outputs out of this cutoff range by the breadth of the cutoff range. For example, if the cutoff were abs(10), the intersection of all numbers > -10 and all numbers < 10 defined the cutoff region, and any outputs outside of this range would be normalized by +10 or -10, depending on whether the output were negative or positive, respectively. In addition to position changes, mice detect button presses. We implemented 4 buttons in our mouse - output on/off, left click, right click, and scroll enable. Each pushbutton is connected to a port pin on our microcontroller. When the output on/off button is pressed, the serial mouse output to the computer is either [re]enabled or disabled. This allows the user to move his or her hand and not have the motion affect the mouse pointer. Left click functions as a mouse left click, right click functions as a mouse right click, and scroll enable disables all motion and other button outputs while it is held down, and the y-output of the accelerometer is translated into a scroll-wheel output to the computer. The only hardware/software tradeoff with which we had to deal was the sensitivity of our analog to digital converter (ADC). The granularity per "click" of the ADC is approximately 19.5mV/click. When we used accelerometers with sensitivities of approximately 50mV/g for our position mouse the outputs of the devices had to be normalized to the full ADC range of 0-5V so that we would have good sensitivity on our device. We will explain in the next section exactly how this was done. For our tilt mouse, we used accelerometers that outputted 1000mV/g, so the sensitivity was much higher, but we decided to normalize the range to 2000mV/g to gain even higher sensitivity, especially since we already had the necessary circuits designed and constructed. Another hardware/software issue one must usually take into consideration is the "bouncing," or inconsistent, state in which some pushbuttons can be after a transition, but our buttons were internally debounced, as can be seen in the below figure, so we did not have to worry about polling them at certain intervals. L, R, and M are the left, right, and middle mouse buttons. A 1 indicates pushed and a 0 not pushed. (most significant) Y7-Y0 (least significant) represents the twos complement mouse delta Y, with positive Y pointing to the bottom of the screen. X is the same format as Y, with positive X pointing to the right of the screen. Z is also in the same format as Y, with positive Z being scroll up. The first 1 bit in every packet is an extra stop bit. From what we've seen, some implementations set it 1, and some implementations set it low. We listened to the data coming off of a genuine Microsoft serial mouse, and it set the bit as 1, so we chose to set it as 1. At http://patft.uspto.gov, we searched for "accelerometer AND mouse" and "mouse AND glove," and we found one invention very similar to our project. US patent #6,870,526 is a "Glove mouse with virtual tracking ball." 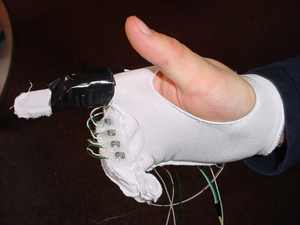 It uses roll of the hand to measure direction of mouse traversal and bending sensors in the thumb and index finger apparatuses to determine whether the mouse will move in a negative or positive direction on the indicated line of orientation. This mouse functions differently than ours, as ours uses magnitude of roll and pitch to determine the direction and speed of the mouse motion. No mention of mouse click buttons was made in the description of this invention. First we wait for the computer to toggle the RTS line. When it does, we send it "MZ," the indicator that we are a Microsoft serial scroll mouse. We respond to 5 queries, then disable query response and start mouse functioning. After the mouse has started functioning, the buttons are sampled on every cycle. If the mouse is not enabled, the program cycles through the button sampling until the mouse is enabled. 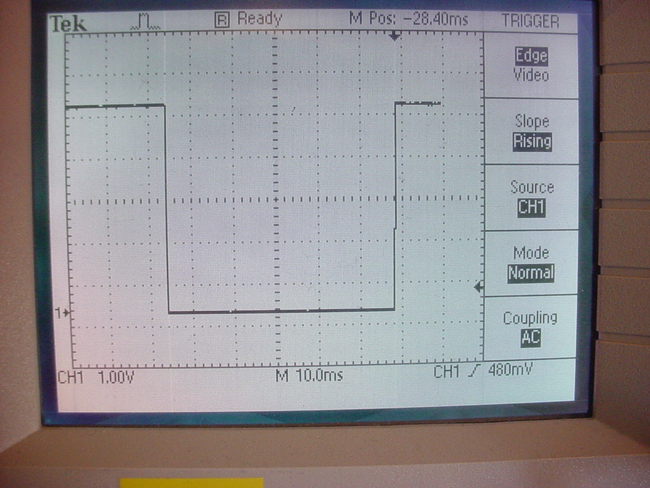 After the buttons are sampled and the mouse is enabled, a check is done to see which acceleration axes have been sampled. If X has not been sampled, set the sample multiplexer to Y, sleep until X is ready, and sample X. The multiplexer is set to Y before we sample X because the current sample being processed is always taken off of the current multiplexer value, which is X if X has not been sampled. If X has been sampled, we check to see if Y has been sampled. If it has not been, set the multiplexer to X, sleep until Y is ready, and sample Y. If Y has been sampled, modify the samples to the correct twos complement numbers, scale them, and create the serial packets. 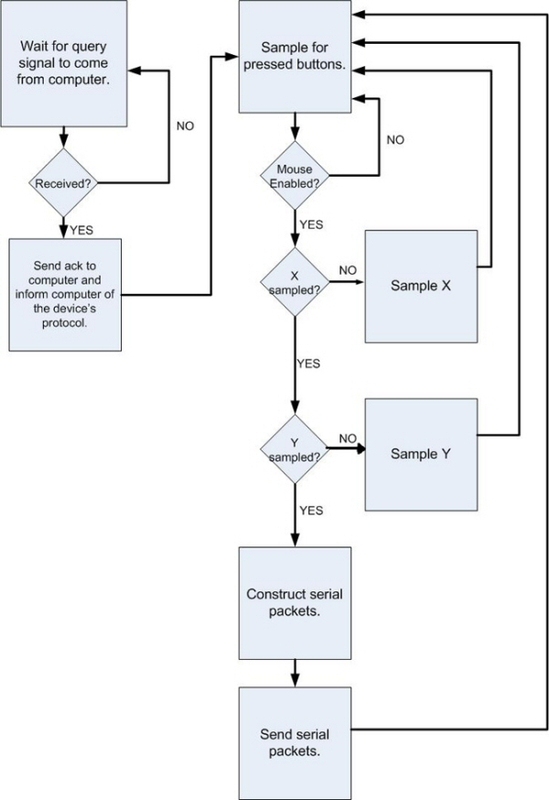 Send the serial packets, indicate that X needs to be sampled, and return to the beginning of the loop. The mouse is enabled and disabled by one of the sampled buttons. If the button value is read as "pressed" and its previous value was "not pressed," the mouse enable/disable is toggled. The tricky parts of this program were the timing and the conversion of our accelerometer output to the proper twos complement number. We had some problems with our accelerometer readings - they became erratic on certain types of reads, specifically when we moved the mouse on the NW-SE plane. We could not figure out how to get steady readings until we googled our problem and found a page put up by previous ECE476 students. These students (credited in our conclusion) built a mouse similar to ours, and to get good readings they slept their microprocessor until the reading was ready. We simply added sleeps before we read our values, and the entire setup worked as we expected it to. As for our number formatting, when we formatted the numbers by performing mathematical operations on them, we found that our math often caused unexpected overflows. These overflows, coupled with the fact that we could never tell if we were casting the numbers properly, prompted us to devise an almost purely bit-manipulative method of converting our accelerometer outputs to numbers that we could send to the computer. Please see our commented code in the Appendix for a detailed description of our number conversion process. The hardware for our project is centered on information gathering and processing. Our accelerometer output goes through 3 stages. The first stage is a lowpass filter that removes the high frequency noise from the accelerometer. The second stage is a differential amplifier stage. The differential stage amplifies the signal by a factor of 2 - this expands the accelerometer output from 1.5V to 3.5V for -1g to 1g to 0.5V to 4.5V. Introducing gain into the accelerometer output allows us to get higher resolution with the ADC because the signal almost fills the 0-5V range of the ADC instead of only filling 2/5 of it. The negative end of the differential input is the accelerometer output. The positive end of the differential input is the output of a potentiometer whose inputs are attached to 5V and 0V. This potentiometer allows us to tune the accelerometer 0g level to a voltage of our choice. The final stage is a protection stage for the ADC. Since the output level of the amplifier is not rail-to-rail with its power supply, we had to use a power supply that could produce outputs potentially damaging to the ADC. 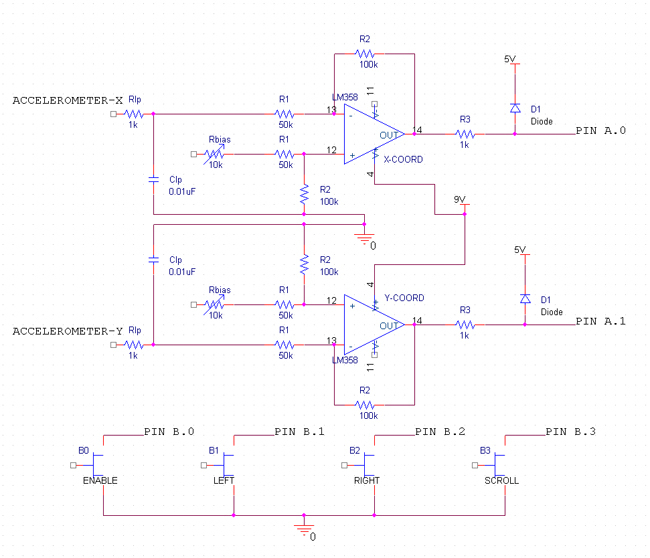 The output of the amplifier goes through a resistor, then through a diode to 5V. The output is taken off of the junction between the resistor and the diode. This prevents the output of the amplifier from getting higher than 5V+the internal voltage drop of the diode (which is about 0.67V). In addition to the two accelerometer inputs to our microcontroller, we poll 4 pushbuttons, which provide enable/disable functionality, left click, right click, and mouse scrolling. These pushbuttons are tied to microcontroller pins and ground. The pins are internally pulled up, so the buttons are active low - pushing the button ties the pin to ground. Please see our schematics in the Appendix for more detail. As was mentioned before, we altered our design slightly from our original idea. Our first design integrated our measured accelerations to translate the lateral movement of the mouse into a position change. Since we could not remove the effects of gravity from our integration, it was extremely prone to error, since any roll or pitch on the device introduced unwanted acceleration to the device. Therefore, we decided to base our motion on the very thing that made our first design improbable - the roll and pitch of the device. Rolling the device counterclockwise moves the mouse to the left, while rolling it clockwise moves the mouse to the right. Pitching the device towards you moves the mouse down, and pitching it away from you moves the mouse up. The vertical motion of the mouse is reversed, much like a joystick in a flight game. We found that this type of motion is easier to adapt to than having the pitch noninverted. Analyse your design in terms of how the results met your expectations. What might you do differently next time? The results of our project somewhat met our expectations. In the initial idea and design phase, we had planned to make the mouse detect and position using absolute position of the hand, but we quickly discovered that this was impossible without using a gyro to provide a reference for the angle of Earth's gravitational force. However, after we modified our design to simply use the tilt of the hand to produce a cursor velocity, we did not have any problems whatsoever in achieving our expectations in our results. In future versions of this project, we would investigate an inexpensive gyro so that we would be able to account for gravity in the motion sensing, therefore allowing us to obtain absolute position of the device in free space. Did you reuse code or someone else's design? Did you use code in the public domain? Are you reverse-engineering a design? How did you deal with patent/trademark issues. We did not reverse-engineer anything in order to create our Airmouse, and as far as we know the Microsoft serial mouse protocol we used it openly published, so we do not believe that someone else reverse engineered it either. There were no patent or trademark issues for us to deal with, as far as we could find. Did you have to sign non-disclosure to get a sample part? We did not have to sign any non-disclosures to get sample parts. We simply went to the company's websites (see Vendor Sites in Appendix) and gave them our information and they sent us the parts we requested to sample. Are there patent opportunites for your project? We feel that there are patent opportunities for our project. When we looked for patents on similar devices, we found only one, but it was still fundamentally different in design than our device as we described in the High Level Design section. Of course, if we were to go commercial with this product, there would need to be multiple sizes, as people's hands vary greatly in size. Our Airmouse project adheres to all of the relevant parts of the IEEE Code of Ethics. The following is an explanation of how it adheres to each relevant point. The claims that we have made our Airmouse can do, both on this website and also in any other forms of communication regarding our project, are 100% true and accurate to the best of our knowledge. The goal of our project is to further our own understanding of the technologies used within this project, and also to expose others to the opportunities that technology provides as applied to modern day personal computing. Throughout the design and implementation of this project, both my partner's and my technical competence improved vastly as we learned how to operate the involved devices and technologies to our own specification. As we learned nearly all we needed to know to complete the task in ECE 476, both of us were fully competent to handle any of the tasks we accomplished during implementation of the project. The majority of the criticism we sought or accepted was from the course staff, primarily Professor Land, Ethan, John, Chethan, and Dan. Most of the ideas in our project were our own, with exception to a small bug fix in the code, which we credited in the Intellectual Property Considerations section to Christopher Kung and Peter Wang. Both members of this project were of the same race, religion, gender, age, and national origin. Further, there were no significant disabilities present between the members. Therefore, there was fair treatment of all persons, regardless of any other inherent differences among the members of the group. As RF transmitters were not used in this project, and there were no devices that are detectable outside the physical space of the project, there were no legal considerations that we needed to adhere to.